Pour sa part, l'habituellement sympathique Pierce Brosnan (...) parvient à rendre parfaitement abject son personnage d'assassin froid et cruel. Survivor se situe donc dans la catégorie des films d’espionnage de série B, mais dont les acteurs suffisent à maintenir l’intérêt pendant 96 minutes. 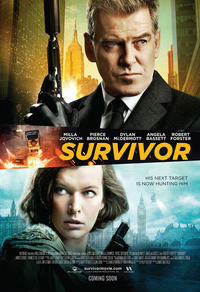 Had the writing been a little sharper and the staging a bit more energetic, Survivor could have been a solid film rather than the immediately disposable filler it ultimately is. The thudding techno score and Danny Ruhlmann’s digital lensing have the effect of making “Survivor” look cheap rather than stylized.